It’s always fun to use up fresh garden veggies by throwing them into a big bowl of tender, herb-spiced pasta. While I have a variety of fruits and vegetables planted in my summer garden, it will be a while before they are ready for harvest. In the meantime, I just love heading out to the local farmer’s market to pick up a healthy dose of garden fresh vegetables for some of my lite warm-weather recipes. This recipe couldn’t be any easier. 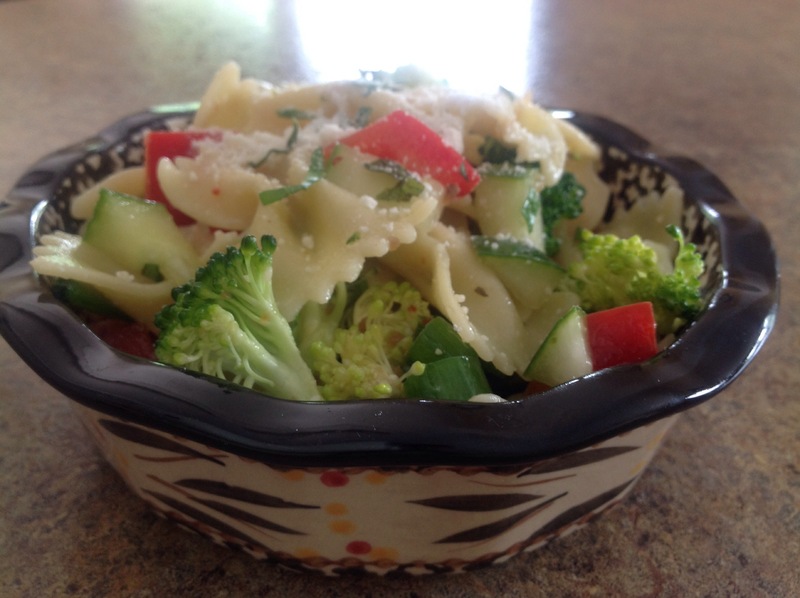 Use your favorite vegetables, cheese, or meat to mix into this cold pasta salad. A tall glass of iced tea and some whole grain crackers can round out the meal as the sun shines, the heat sets in, and we welcome the lazy days of summer. Fill a large pot with lightly salted water, bring to a rolling boil over high heat. Stir in pasta, return to a boil. Cook uncovered, stirring occasionally, until the pasta has cooked through, but is still firm to the bite, about 8 minutes. Drain and cool by running cold water over the pasta in a colander set in the sink. Coat with a small amount of dressing to prevent pasta sticking together. Cool completely. 2. Combine pasta, vegetables, and herbs in a large bowl. Pour the remaining Italian dressing over the salad and stir to combine. Cover and refrigerate for at least two hours. Sprinkle on Parmesan cheese before serving. Just a great warm weather salad…thanks for your comment! It’s an easy salad and you can add all of your favorites. The recipe sounds easy and I love fresh veggies so I will, thanks! Will be taking this to a luncheon date next week. Thanks for the idea! Enjoy, Judie! Have a great lunch date! We sure enjoy it! Thanks for your comment!